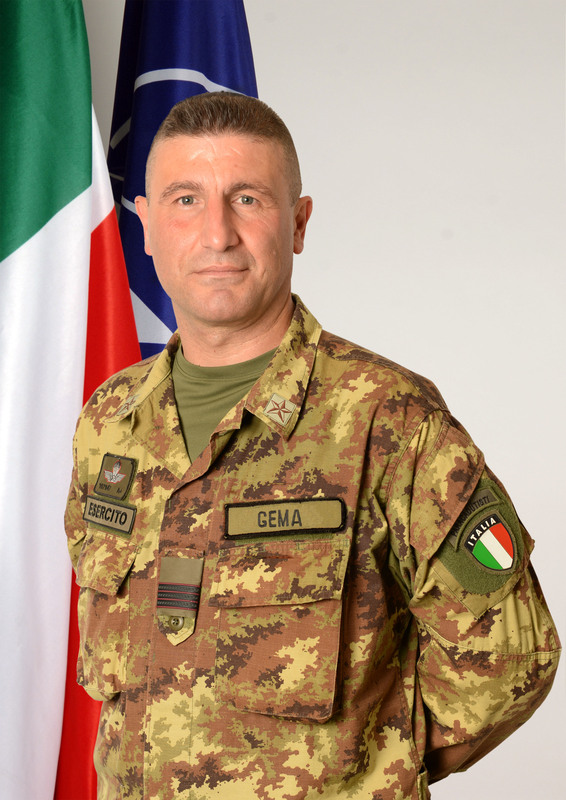 Command Sergeant Major Bortolino Gema was born in Berzo–Demo (BS) in 1965, enlisted the Army in 1985 and attended the Military Parachutist Course at the Italian Airborne Military School in Pisa. His first assignment was to the 13th GRACO (Target Acquisition Group) “Aquileia”. In 1986, Command Sergeant Major Gema attended the 59th Squad Leader Course at the Infantry and Cavalry School in Cesano di Roma. In 1987, once back to the 13th GRACO, he served as airborne target acquisition squad leader first and platoon commander after. In the period from 1993 to 1999, he was assigned to the Long Range Reconnaissance Unit in Verona, where he served as Long Range Reconnaissance Patrol Leader. From 1999 to 2001, he was assigned to the 4th Mountain Troops Parachutist Battalion in Bolzano. In the same period, he completed the rigorous “Ranger” Assessment and Selection Program, to join the ranks of this elite Italian Army Special Operations Command Unit. From 2001 to 2009, he was assigned to the Operational Land Forces Headquarters, where he served as Training Non Commissioned Officer. From 2009 to 2012, Command Sergeant Major Gema was assigned to the Allied Rapid Reaction Corps, in Germany first, and then in the UK, serving as Personal Assistant to the Deputy Commander. During this 3-year period, he deployed to Afghanistan, serving as Staff Assistant to the Deputy Commander ISAF Joint Command / Senior National Representative in Afghanistan for 15 months. Back to Italy in September 2012 he was assigned to the 4th Mountains Troops Parachutist Regiment “Monte Cervino” in Verona. Weingarten (Germany). Among those, Command Sergeant Major Gema successfully attended the Sharp-Shooter Course, the Close Quarter Battle Course, the Long Range Recognition Patrol Leader Course and the Survival and Resistance to Interrogation Course. Among his many certified skills, Command Sergeant Major Gema is qualified as a Military Free-Fall Jump Master, Military Skiing and Mountaineering Instructor, Snow Avalanche Search and Rescue Expert, Mountains Rescue Squad Team Leader and Technical Director for Military Mountaineering Courses. “Alpinista Militare Accademico” (Military Academic Mountaineer) ribbon. He assumed his present position as HQ NRDC-ITA Command Sergeant Major on December 1st, 2014. Command Sergeant Major Gema is married to Mrs. Andrea and they have one daughter, Giulia. He prefers to spend his leisure time for outdoor activities, including hiking, skiing, free climbing, skydiving. Heavy Metal and rock music relaxes him, while boosting his motivation.